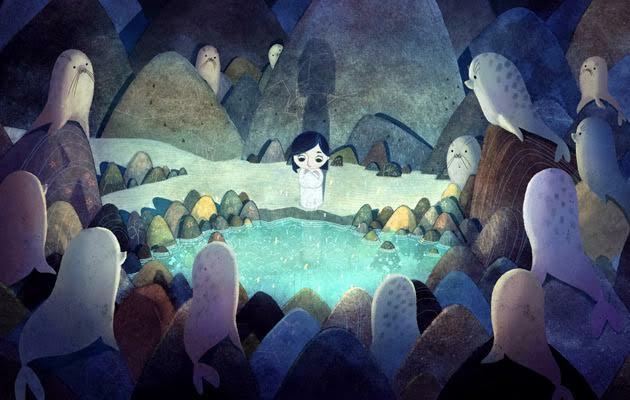 Drawing on Celtic selkie myths, this animated film is utterly immersive. Mr and I attended a lunchtime showing at Watershed, Bristol, and were initially perturbed to find ourselves surrounded by parents with small children, including one babe in arms. However, as soon as the intricately detailed and gloriously colour-saturated images flooded the screen, all audience members grew still and silent, entranced by the story and the scenes. The story opens with a little boy, Ben, and his mother Bronagh singing to her unborn child, while Ben’s father Conor looks on fondly. Six years later, there’s no sign of Bronagh, and Conor is a broken man, with only his love for his son and daughter keeping him going. Ben finds his wordless younger sister, Saoirse, a terrible annoyance. He’s developed a fear of the sea that laps at the foot of their lighthouse home, and attracts his sibling in ways he cannot understand. Weaving together ancient mythology and very relatable issues of grief, jealousy and sibling rivalry, the tale introduces peril and intrigue, partly in the form of an owl witch (a bit scary for little ones), several adventures in caves and a stormy night in a small boat at sea. There is humour to balance out the moments of fear, particularly with faithful and immense hound Cú and the Seanachaí with his slipshod memory and stories caught up in his beard. Moone Boy’s David Rawle is fantastic as Ben – developing from resentful to protective to heroic by the end of the film. But above all, this is a film of exquisite beauty. Interviews with writer and director Tomm Moore reveal how the imagery has its roots in his own watercolours – and the fluid, textural style of each frame is intensely and painterly. From the underwater segments where sea jellies waft like abstract lampshades to the cross-country odyssey populated with every kind of rural Irish wildlife, to more intimate scenes such as Saoirse discovering her selkie coat for the first time (above), it’s a rolling array of treats for the eyes and for the heart. 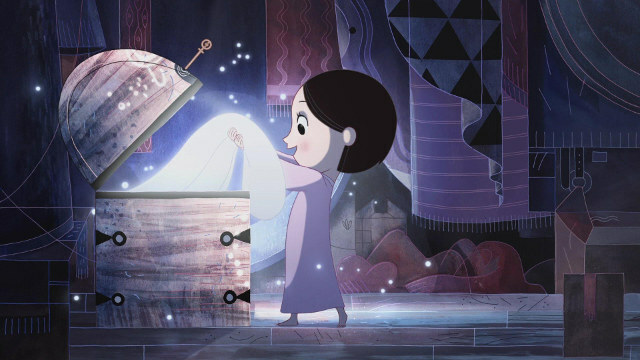 Song of the Sea is a gem of a film, emotionally and visually rich, and if you’re lucky moments from it will replay in your mind at unexpected times for days following. The Song of the Sea is currently playing at Watershed, Bristol and cinemas throughout the UK. Gain an insight into the film here. 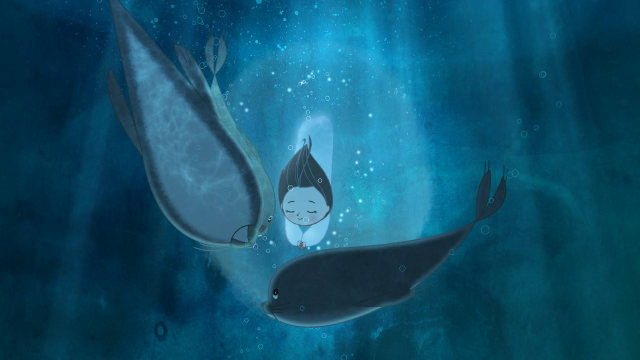 This entry was posted in Reviews and tagged animated films, art, film reviews, selkie myths, Song of the Sea by Judy. Bookmark the permalink.